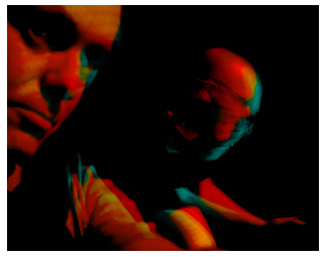 The final release from Bourbonese Qualk before they disbanded in 2003 was recorded from 1999 to 2001 and released on the Dutch ‘Korm Plastics’ label. This period saw the group making intermittent performances in Europe; Berlin, Dresden, Moscow, Naples. Miles Miles: Guitars, Saxophones and other instruments. Simon Crab: Electronics, Violin and voice. Veterans of experimental music make a homecoming of the here and now. Bourbonese Qualk, whose last release was in 1993, are back sounding new and fresh and completely present tense. It seems logical really, when one considers the futuristic-ness of experimental music, so that what BQ started in the 1980s would transfer into timeless sounds and current application. On Uncertainty plays like a collage, with each track disconnected from the others, but making a whole picture. For some reason, it puts me in mind of the old sci-fi animation Fantastic Planet. Track to track there is a depiction of differing moods and sentiments, with very little literalism and loads of ideas set in spiral for the individual listener to interpret. The disconnections do break up any chance of fluidity for the overall sound, but also seem necessary to leave a lot of room for the individual to create a cohesion in their own mind. Basically this is an electronic Ambient record. There are plenty of organic sounds as well, though, so as not to sound too computer generated. The ambience gives way often to a very groovy Funk flow with a lovely bit of rythym guitar which further alienates this music from being classed as just one kind of thing. There are vocals lent in by Isa Suarez, but they are so minimal as to be easily missed. There are many moments of peaceful orchestrastions, something dreamlike about all that spacey ebb and flow, and more than a few very noisy parts that just don’t go with the pretty parts, but then again they do. One gets the impression that Bourbonese Qualk are a set of muscicians and programmers who have skill running out their ears, have been trapped on a deserted island for the last seven years or so, and have suddenly found themselves back in the world of the programmable, and the playable. Let’s just hope they don’t do another disappearing act too soon. Finally an experimental band that has something to say (even with no lyrics involved)… I started fearing that intelligent contents were only left to diy punk bands… Bourbonese Qualk are a UK anarco-experimental group/collective from the eighties. They were involved in anarchist and radical movements and manifestations such as “Stop the City” and the Trafalgar Riots. After touring Europe, eastern Europe and the US and releasing works on their labels “RecLoose Organisation” and “New International”, in 1993 they released their last CD “Autonomia” (not surprised by the name at all!) and then disappeared until now. “On Uncertainity” is a beautiful ambient album that you wouldn’t expect to be theirs if you considered that “Autonomia” was gabber-techno and previous works were a mixture of acoustic instruments and electronics. 10 years after they are back with the same peculiar sound but they dropped the aggressive beats and the traditional instrumentation (only the last but one track in this album has a jazzy flavor with drums and clean guitars) in favor of floating ethereal soundscapes with occasional electro-beat patterns and enchanting heavenly textures made of lush synth layers, harmonious pads or even long reverberated saxophone notes. Dreamy and calm. Charming and colorful. The info sheet says that even after coming back from their hybernation, they remain true to their original sound… Well, I haven’t had the pleasure to hear their older recordings, but I can only tell you this much: if they were doing this stuff two decades ago they were waaaaaaaay ahead of the curve!!! Bourbonese Qualk ont été parmi les premiers pionniers et précursuers de la musique électronique au début des années quatre-vingts et sont restés au sommet de leur art depuis, discretement, en devenant une référence incontournable pour de nombreuses formations électroniques et post-industrielles actuelles. Pourtant les classer exclusivement dans le monde de l’électronique reste difficile, vu leur utilisation éclectique d’instruments acoustiques mêlés aux expérimentations diverses par ordinateur. De 1983 à 1993, Bourbonese Qualk réalisent tous leurs albums sur leurs propres labels “RecLoose Organisation” et “New International”. Ils profitèrent ainsi de sortir des disques d’autres formations comme Muslimgauze. Bourbonese Qualk étaient également connus à l’époque pour leurs idéaux politiques anarchiques, et leurs participations diverses à des manifestations à Londres ou à des événements contestataires en Europe de l’Est, avant la chute du Mur de Berlin. Etant toujours restés farouchement indépendants, ils se caractérisent comme une des formations britanniques les plus originales de la scène underground, ayant touché autant à la musique qu’à l’écriture et la vidéo. Le groupe disparut suite à la sortie de leur album “Autonomia” en 1993, à notre grand désarroi, voyant ses membres évoluer au sein de projets divers. Une des meileures nouvelles de cette année 2001 réside à coup sûr dans la reformation de ce projet culte, agrémentée de la sortie de ce nouvel album d’une qualité irréprochable. Alliant les subtilités les plus délicates et belles de l’electronica aux structures rythmiques de l’électro-expérimental, en y intégrant un soupçon d’architecture noise et industrielle aux sculptures sonores d’obédience post-rock, telles des compositions de guitare savamment ambient, Bourbonese Qualk nous révèlent une fois de plus l’ampleur de leur talent, ainsi que leur aptitude, à l’instar de Coil, à rester fidèles à leur son et à leur éthique, tout en gardant fièrement leur place au firmament de l’avant-garde des musiciens indépendants européens. Très fortement recommandé, indispensable ! 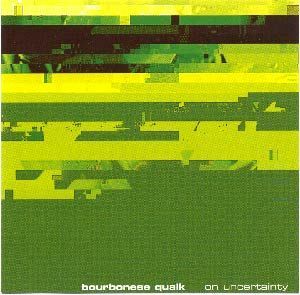 Seems like a mystery to me how British Bourbonese Qualk have flourished the European experimental scene in more than twenty years without any greater attention. 1997’s album “The government is my soul managed to catch some attention, but not on a scale that measure up with what the originality of Bourbonese Qualk’s musical explorations. Hopefully “On uncertainty” released on Korm Plastics, will open the eyelids of the world a little further. Opening the album with the track “Modified”, the listener is pulled into a Zoviet France-kind of sonic disturbance. After that the album makes a radical change into a much softer expression. Computer-attendant Simon Crab turns the electronic equipment into a friendly soft sound station, with only a few noisy outbursts occasionally while Miles Miles gently treats various acoustic instruments. Thus the musical trademark of Bourbonese Qualk is the strange mixture of electronic sound with acoustical sounds, making it hard to mono-categorize their style. While the acoustic part of the Qualk’s sounds like a crossover between a Tortoise-kind of post-rock and futuristic chamber orchestral manoeuvres, the electronic side mostly floats in chill-out-spheres with a few visits into more threatening heights of noise sounds. After two decades of sonic experimentation, Bourbonese Qualk still remains true to their original sound. “On Uncertainty” could be the key to opening the treasure of Bourbonese Qualk for the outside world.